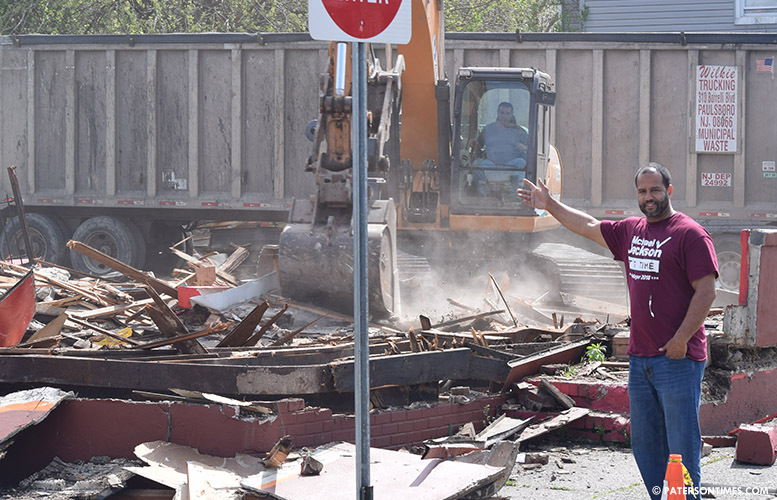 The former chicken shack on North Main Street that has been described as an “eyesore” and “crime magnet” has been demolished. Councilman Michael Jackson watched as the U.S.A. Fried Chicken at 144 North Main Street came down on Saturday morning. He arranged for the demolition of the chicken shack by renting an excavator and collecting a volunteer crew to operate the machinery. Jackson said it was a collaborative effort between him, Habitat Homeowners Association, the Grace Chapel Church which owns the building. “We agreed that this chicken shack was not only an eyesore, but a magnet for illegal and drug activity. People would congregate out here 3, 4 in the morning,” said Jackson, who represents the 1st Ward, where the building is located. Jackson said the demolition cost under $10,000. He had to volunteer with the crew. He operated the fire department’s hose to spray down the dust that was originating as the building was being torn down. There’s a plan for a community center, said Jackson. “Together, our vision is to make this a site for a new community center,” said Jackson. He said the church will convey the property to the homeowners’ association. “I made a commitment to demo the property,” said the councilman. Jackson personally secured demolition permits from the city to tear down the structure. He said the property was vacant for a year and half after the church recognized the chicken joint was causing problems in the Northside neighborhood. “They agreed they wouldn’t lease,” said Jackson. There were some delays. For example, it took 8-9 months for PSEG to disconnect utilities at the building. PSEG had difficulty determining whether the gas connection was on the Haledon Avenue or the North Main Street side, said the councilman. “It was a very lethargic process. I thought it would be quick,” said Jackson, who is one six men running for mayor. Jackson said the volunteer demolition crew generously donated their time to the church. They just moved over to North Main. Drive through there at night during the summer. The cops are scared to go through there too busy writing tickets on Haledon Ave.
There’s a plan for a community center, said Jackson. No there isn't. This guy cant stop lying. payback the money you owe. He supposedly can get this done. But he can't get his drivers license straight. He definitely doesn’t care. He has an agenda and it’s not good!